Does your company depend on SQL Server? Are the costs for supporting and managing it spiraling out of control? 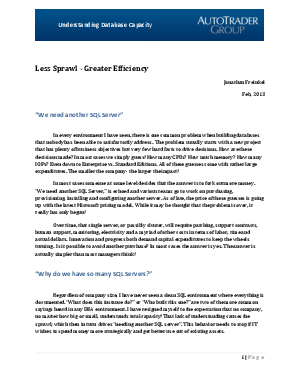 While your DBAs discuss SQL Server sprawl, buying more and more equipment isn’t the answer. In this new white paper, learn the three questions to ask to see if you’re wasting money on SQL Server. Then, learn how you can efficiently maximize database capacity, and how to get the most value out of your current and existing assets. Finally, see how to move forward while enjoying the rewards of better, and more efficient, asset utilization. Get this white paper today.